The characteristic yellow-orange color of Saffron (Crocus sativus L.) comes from water-soluble pigment, the carotenoid crocin. Saffron carotenoids with ethanol-extractable mostly contain safranal as an antibacterial was used in Persian traditional medicine to treat some skin disorders. The extracted carotenoids from saffron as an antioxidant prevent many common diseases by taming harmful molecules known as free radicals. 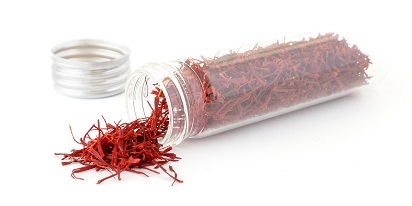 This paper reviews the application of saffron extracts from dried saffron stigmas by aqueous ethanol in formulation of cosmetics, skin cares and sun protection products. Saffron is used in pharmaceutical and health care products as well as a flavoring and a coloring agent in foods. The tincture of saffron used to remove pimples and soothe rashes in Persian traditional medicine mostly by Avicenna (1981) worldly physician who lived a thousand year ago (980-1037). Saffron has three main chemical components. The bright yellow coloring carotenoids; a bitter taste, picrocrocin; and a spicy aroma, safranal. The carotenoid pigments consist of the carotenoid glucose esters that the major component is crocin, crocetin-di-(ß-D- digentiobiosyl)-ester. The other carotenoid glycosyl esters are contained of the diapocarotene, dioic acid this acid known as crocetin. Watersoluble picrocrocin has a sedative effect on spasms. The volatiles and ethanol-extractable components of saffron as flavor and spicy aroma mainly due to its safranal content. Safranal well known as antibacterial properties of saffron, the researchers have been realized that theanti pimple activity of saffron extracts is due to safranal component. 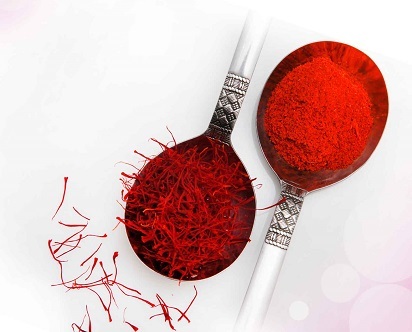 In thisresearch the stigmas of saffron are collected and immediately dried, after grinding extracted three times with aqueous ethyl alcohol, the extracted colors checked for purity by HPLC analysis for determination of carotenoids components, and will used as coloring agent for formulation of health and beauty care products. The extracted yellow color mostlyconsist of crocin, this extracted easily soluble in water, propylene glycol and glycerin, and based on the application use in formulation of perfumes, body lotion, hair shampoos, hair care products, moisturizing creams, sun protection creams and liquid soaps as coloring agent. Saffron extracts use in formulation of sun protection lotions and creams as an antioxidant for the reason of water-soluble carotenoids, crocin and crocetin components, and antibacterial properties, the antioxidant is able to trap and neutralize free radicals. Free radicals are atoms orgroup of atoms, which originate from severed sources including environmental toxins, and chemical toxins. Aging of skin is the result of the oxidation of free radicals in the skin and saffron color contain carotenoids scavenge lightinduced free radicals thereby reducing the damaging effects of long term exposure to UV rays on skin cells. The sun is potentially our skin’s worst enemy, sending out damaging ultraviolet rays (UV) that not only dry our skin, rather can cause alterations in skin cells that can lead to various skin disorders andpossibility skin cancer. Most of the damage caused by the sun that means we are all at risk; our skin needs more preventative actions, with the antioxidants. Wrinkling of the skin occurs when it loses its elasticity and for many is a visible sign of aging. Aside fromnatural aging process, other factors contributing to wrinkling include sun exposure, poor nutrition, muscle tone, stress, exposure to environment pollutants, smoking and poor skin care. Keeping the skin supple through moisturizes and supplements, as well as protecting it from free radical damage will help to minimize wrinkling, and will help to minimize aging. Saffron color as an antioxidant helps prevent many common diseases by taming harmful molecules known as free radical. Saffron carotenoids as antioxidant mostly because of major component, crocin with chemical name of crocetin-di-(ß-D- digentiobiosyl)-ester with carotenoid chain scavenge free radicals and thereby possesses the effective properties of preventing aging, fighting wrinkles eliminating dark spot and acne when used in the formulation of health care and beauty care products. The compounds like beta-carotene, vitamin E, mineral selenium, andpolyphenoles extracted from green tea have proven antioxidant abilities to protect skin cells. Saffron color with these antioxidants works synergistically to help nourish, hydrate and protect the skin especially after a day in sun or exposing skin to any damaging elements in formulation of lotions or creams. Nowadays, should pay more attentionon our foods, and health care products due to industrial life and using lots of chemical products that have increased rate of cancer in the conclusion using natural products by producers such as saffron, cause less side effect and decrease rate of cancer. 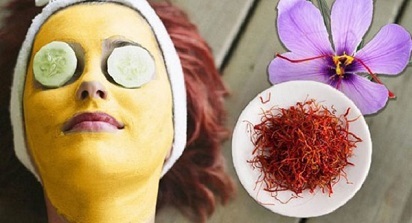 The unique characteristic of saffron,yellow orange color water –solublecarotenoid, compare with lycopene and bixin as oil- soluble take advantages for water base products like lotions, perfumes, shampoo and liquid soaps; simple extraction method with general and industrial solvents, altogether present new application of saffron as natural yellow color in health care and beauty care industries. In the future looking at saffron should remind us more than a spice, and will be used in formulations by producer continually as nutrition supplement in daily diet with other carotenes like beta-carotene, also used in advanced formulations of cosmetics and highlighted in the ingredients with proud “all natural with natural color(saffron)”.